Well, before I talk about this artwork, I'd like to say "Happy Thanksgiving!" to those of you who live in the States. Be thankful for what you have. I know, sometimes it's difficult to not think of the things that aren't "right", when you're trying to think of the things that are. But, it's so important to focus on the things that you love about your life!! What you focus on g-r-o-w-s!! So, whatever you want more of... focus on that! Do you want more chaos, sadness and grief in your life? Then, by all means, focus on that! Because that's what that will get you. If you don't want any of that, don't focus on it. Don't talk about it; don't blog, incessantly, about it. Give your attention to the positive things! And, be grateful, each and every day! Some time in your day - in the morning, which would be a great way to start your day - or, in the evening, which would be a wonderful way to go to sleep - write down five things that you're grateful for. Think of those things during your day. Dwell on those things... not all the not-so-good things that are going on in your life! So, I've had a wonderful Thanksgiving Day with my family. All four of our kids were with us, which is a rarity these days! The oldest was there, with her boyfriend - they've been together for three years, but he'd never had Thanksgiving Dinner with us before. So, that was nice. Our older son's girlfriend was there, too - that was also nice. We had a wonderful dinner, played a couple of games and had a nice visit. I have much to be thankful for, that's for sure!! OK... so, about these ATC's. Creative Imaginations is hosting an ATC Raffle. They have a line called Luminarte - various kinds of paints, in bottles with dauber-tops, sprays, little pots of shimmering watercolors, called "Twinkling H2O's". All great products! If you go to the Creative Imaginations website, they'll tell you all about the raffle. Your ATC is your raffle ticket, which could win you Luminarte paints and "Luminarte Friendly" products. So, I put the background down on this "sun and moon" one first. But, I actually finished the "autumn greetings" one, first. For the sun and moon, I put down, with the dauber-top Radiant Rain Color Concentrate (which is a watercolor/acrylic paint blend), some Hot Cinnamon and Mallard. This was done on glossy paper, cut to the size of the ATC. 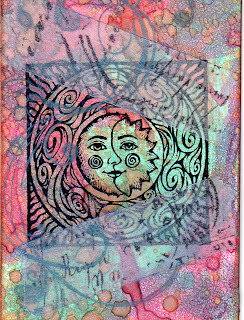 (always 2.5 x 3.5") I wasn't sure I liked what it looked like.... so, I sprayed on some of the Shimmering Mist (Radiant Rain Shimmering Mist) in the Ginger Peach color. I started liking it at that point. :) Then, I saw that I had some of the color, in puddles, on my craft-mat, so I took a pre-made ATC, made for acrylics, and put that, face-down, swirling it all around the puddles of color. That's how I got the background for the "autumn" one. I continued with the autumn one and got it finished. I just now came back to the "sun and moon" one to finish it up. 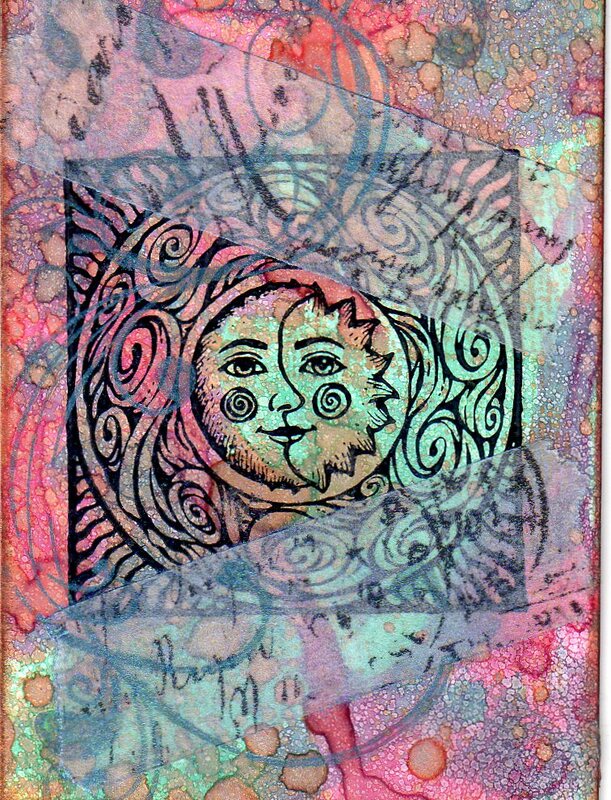 I stamped the sun and moon stamp, with Jet Black Staz-On ink. 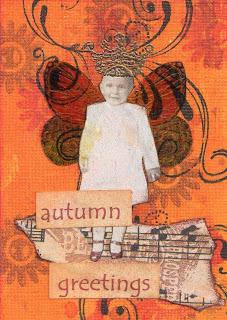 Then, I used an acrylic flourish stamp, with some VersaMark watermark (clear) on it and stamped over at the left....kind of around the black stamped image. Then, I used True Blue Pearl-Ex pigment powder, by Jacquard) (I LOVE pearl powders!!) over that flourish. I heat-set that, by misting it with water in a mini-mister (a Ranger product by Tim Holtz) and dried it with my heat gun. 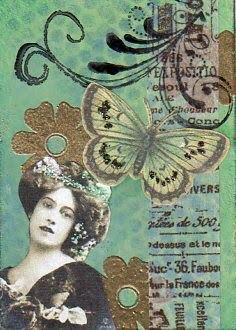 I then took a couple of pieces of Tim Holtz' tissue tape (I'm pretty sure mine is the Nostalgic set, but I'm not sure - I threw away the packaging!) and laid those cross-wise, how you see them. Photos just don't do these kinds of things justice... you kind of lose some of the shimmer.... or brilliance... of the whole thing. Oh, well. acetate pieces and playing around with the inks on those. I'll let you know how it goes! For now, it's bed-time!! I'm not sure how I missed this little guy... I made him two years ago, and, somehow, he never made it to my blog! His name is Ollie. That was a friend's idea... I'm not sure why. But, it's a cute name, so I stuck with it. :) The pattern came out of Martha Stewart's Living magazine. I know, it's a little early for Christmas stuff... well, not if you're making things, but for general decoration. I like to enjoy the beautiful colors of Fall before we jump into Christmas. We already have some Christmas lights up downtown! They're beautiful, don't get me wrong... but, already??? Really?? Wow....it's shaping up to be a gorgeous, sunny day!! Cool, but sunny! Yay!! It was fun to do, although I always come to a point where I'm like a deer in the headlights! I need to do some art-exercises, to get over that. 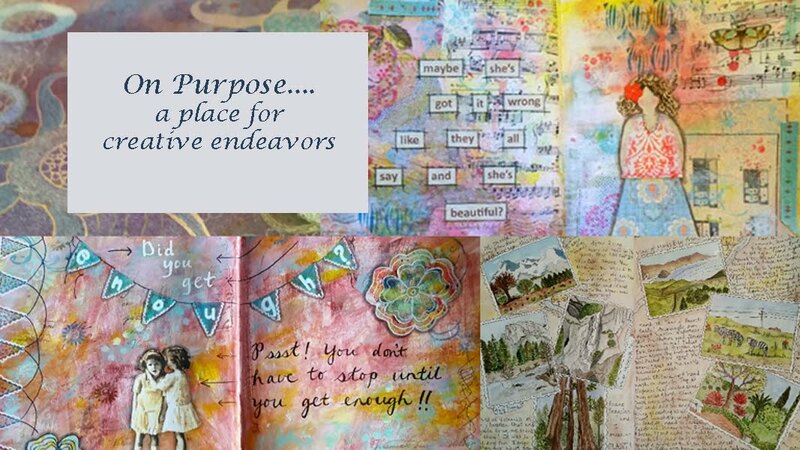 Choose a time where I won't get interrupted; I can't allow myself to stop... just go, go, go..until it's finished! Otherwise, I get too "in my head" about it... and our muses can't work through us if we're doing that. 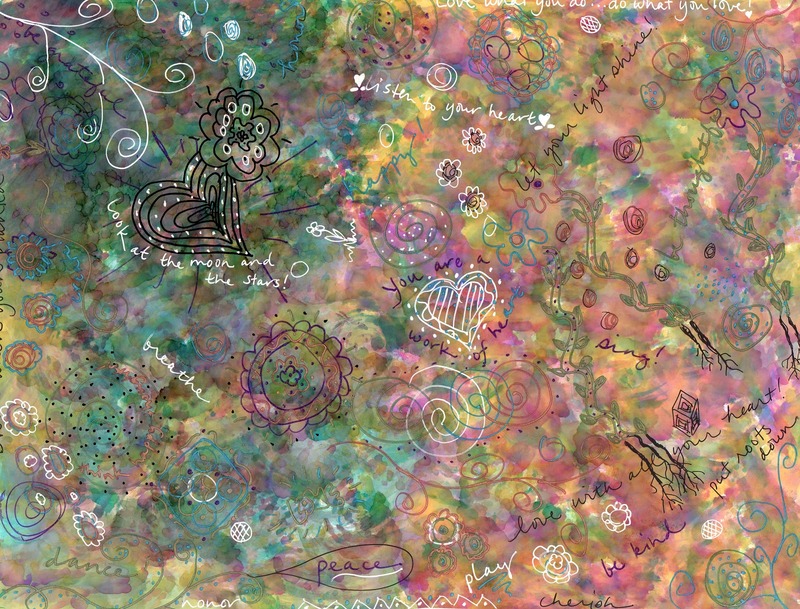 There's an exercise in the book, Kaleidoscope, by Suzanne Simanaitis, (who runs artitudezine.com) where you get all of the supplies out that they tell you you'll need and for each step ~ you set a timer; when that timer goes off, you move on! You don't really *have* time to think too much! You're also not allowed to read ahead, before you begin the project. :) I haven't done it, yet, but it's one that's definitely on my "Art-To-Do-Soon" list!